UPDATE: Detour Tonight on Eastbound Greenway, Westbound Dulles Airport Access Highway Detour and Westbound Dulles Toll Road Stoppages Cancelled Friday, Nov. 17 at 8 p.m. - Saturday, Nov. 18 at 5 a.m.
Friday, Nov. 17 at 8 p.m. - Saturday, Nov. 18 at 5 a.m.
On or about Friday, Nov. 17 from 8 p.m. through Saturday, Nov. 18 at 5 a.m., drivers using the eastbound Dulles Greenway will experiences lane closures and a detour while Dulles Corridor Metrorail Project crews set a pedestrian bridge that will provide access over the highway to the Silver Line's Ashburn Metrorail Station. The detour of the westbound Dulles International Airport Access Highway (DIAAH), and the triple left lane closure and 20-minute stoppages on the westbound Dulles Toll Road (DTR) that were scheduled for tonight have been CANCELLED. See details below and on the following page. 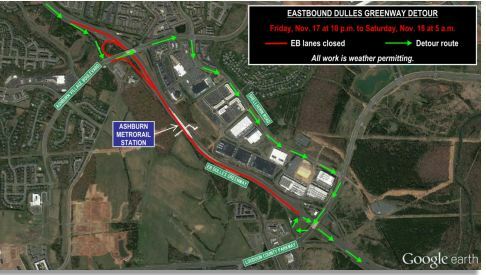 EASTBOUND DULLES GREENWAY: Friday, Nov. 17, 10 p.m. to Saturday, Nov. 18, 5 a.m.
Left lane closures on the eastbound Dulles Greenway prior to Ashburn Village Boulevard will begin at 8 p.m. At 10 p.m., the eastbound Dulles Greenway will be closed between Ashburn Village Boulevard and the Loudoun County Parkway (see Figure 1). Traffic will be detoured to northbound Ashburn Village Boulevard, eastbound Shellhorn Road, and the southbound Loudoun County Parkway to return to the Dulles Greenway. Figure 1: The eastbound Dulles Greenway will be detoured to secondary roads. CANCELLED: WESTBOUND DTR and DIAAH: Friday, Nov. 17, 10 p.m. to Saturday, Nov. 18, 5 a.m. The detour of the westbound DIAAH scheduled for tonight has been cancelled (see Figure 2). have been cancelled (see Figure 3). Figure 2: (CANCELLED) Traffic on the WB DIAAH will be diverted to the WB DTR near mile marker 8.3. Figure 3: (CANCELLED) A triple lane closure and 20-minute stoppages will occur on the westbound DTR.